Over the past decade, the preferred retail experience has shifted from traditional bricks and mortar to e-commerce. Retail stores took a hit, and as a result, shuttered. But now, as the lines blur between digital and physical retail spaces, brands have a new vision for the in-store experience to entice their customer. The last time the Ebco was in Miami, we headed to the newest "shopping mall" and more - Brickell City Centre - to experience first-hand how the in-person shopping experience is being reshaped by some of the world's biggest brands. Miami is leading the way for a new model in urban shopping that challenges the online shopping phenomenon of the past decade. A multi-use city within a city in the Brickell neighborhood of Miami - a place to shop, live, work, play and stay for locals and tourists alike - BCC is a magnet for the newest experiences. It’s also a building of extremes. At $1.05 billion dollars, it is one of the most expensive city centers in the US, and the tallest building in Miami. And everywhere you turn, today’s macro-trends are brought to life within the “walls” of the open-air village of Brickell City Centre. Step inside Brickell City Centre to see what macro-trends you'll find under one roof. The “enclosed malls” of America have been slowly dying out over the past few decades. Brickell City Centre took a page out of Bal Harbour’s open-air concept playbook and changed the mall shopping customer experience. “Underlying (Brickell City Centre's) city-within- a-city is a fairly rigorously conceived master plan: “a true jigsaw puzzle,” as architect and Arquitectonica co-founder Bernardo Fort-Brescia calls it, one that weaves in and around the existing streetscape, merging with the city itself. “We didn’t want to disrupt the urban fabric, so we chose to keep the blocks and the existing streets in place,” he said. The enclosed mall owes its birth to Vienna-born Victor Gruen, who designed the 800,000-square-foot Southdale Mall in Edina, Minnesota. It was designed to be a machine for selling. Another mall in the Miami area, The Shops at Bal Harbour, first challenged the concept in the U.S.
Gruen also proposed a self-enclosed octagonal beehive for the Bal Harbour Shops in the late 1950s. Developer Stanley Whitman rejected it in favor of a plan by Herbert Johnson that featured a central, open-air promenade, fountains, exotic plantings and no need for central air conditioning. The plan was urban and refreshingly bucolic at the same time. While relatively small and specializing in luxury brands, Bal Harbour Shops proved to be one of the most successful malls in the world and continues to perform well today. Enhancing the customer experience is a trend that is slowly becoming a must - The bricks and mortar shopping experience must be more than a transactional one to compete with the ease and simplicity of it’s counterpart, e-commerce. Plan your BCC Itinerary on the Website - A creative way to realize there is enough to keep you busy at Brickell City Centre for days. Convenience drives demand for fast, but high-quality, services that fit into customers' schedules. As personalization and customization trends grow and consumers get more and more used to getting exactly what they want, on-demand custom solutions are becoming a reality, even in industries that were traditionally slow to deliver customization. 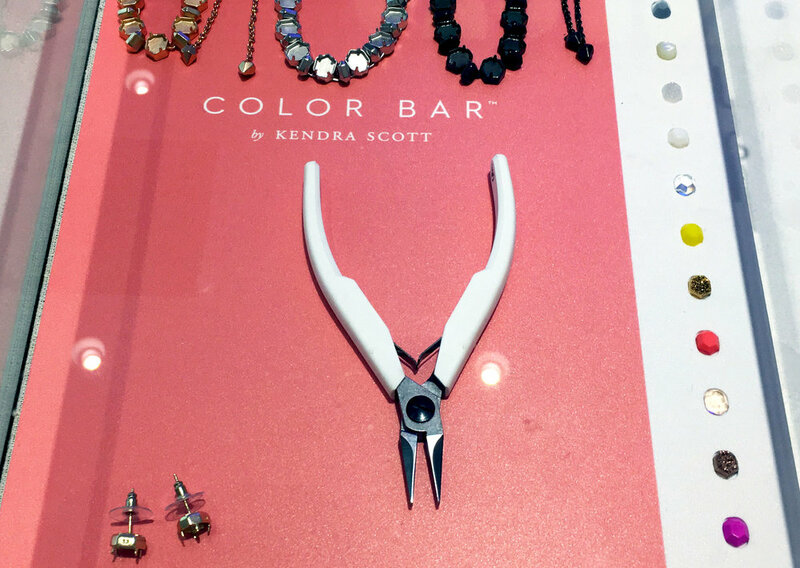 At jewelry designer Kendra Scott's namesake store, customized jewelry is created while you wait on site at their Color Bar. .
Burger King's long- standing slogan, "Have it your way" exemplified the personalization allure. At Dr. Smood, food customization is taken to the next level. Beyond customized menu items, Dr. Smood allows customers to select the mood they want to experience as well. Climate change, EPA regulations and a spotlight on the dangers of plastics has put the environment on the main stage. Consumer and brand choices are being scrutinized more than ever as the world works to make socially responsible choices. Fitted with massive fabric- covered louvers, Swire’s “Climate Ribbon” — thus named because it resembles a crumpled strip of ribbon — is designed to admit natural light while shading shoppers and channeling prevailing breezes from Biscayne Bay to cool them. The highly engineered canopy, the product of a collaboration between a Paris design firm and the universities of Carnegie-Mellon in Pittsburgh and Cardiff in the U.K., is believed to be the first of its kind, and possibly the biggest passive shading and ventilation device — i.e., not dependent on air conditioning — in the country. An eco-friendly, self-service car wash option in the parking garage offers customers a convenient and conscious choice.